That I believe leaders of a particular faith are better leaders because of their faith than another – I don’t. That I believe a particular philosophy (Christianity v. Islam v. Hinduism v. etc) is superior than another in its application to healthcare or business or leadership (topics of this blog) – I don’t. Jesus said several times, “Come, follow me.” His was a program of “do what I do,” rather than “do what I say.” His innate brilliance would have permitted him to put on a dazzling display, but that would have left his followers far behind. He walked and worked with those he was to serve. His was not a long-distance leadership. He was not afraid of close friendships; he was not afraid that proximity to him would disappoint his followers. The leaven of true leadership cannot lift others unless we are with and serve those to be led. It is a wise leader or a wise follower who can cope with the “reproof of life.” Peter could do this because he knew that Jesus loved him, and thus Jesus was able to groom Peter for a very high place or responsibility in the kingdom. The Savior’s leadership was selfless. He put himself and his own needs second and ministered to others beyond the call of duty, tirelessly, lovingly, effectively. So many of the problems in the world today spring from selfishness and self-centeredness in which too many make harsh demands of life and others in order to meet their demands. This is a direct reversal of the principles and practices pursued so perfectly by that perfect example of leadership, Jesus of Nazareth. Jesus’ leadership emphasized the importance of being discerning with regard to others, without seeking to control them. He cared about the freedom of his followers to choose. Even he, in those moments that mattered so much, had to choose voluntarily to go through Gethsemane and to hang on the cross at Calvary. He taught us that there can be no growth without real freedom. One of the problems with manipulative leadership is that it does not spring from a love of others but from a need to use them. Such leaders focus on their own needs and desires and not on the needs of others. Jesus knew how to involve his disciples in the process of life. He gave them important and specific things to do for their development. Other leaders have sought to be so omnicompetent that they have tried to do everything themselves, which produces little growth in others. Jesus trusts his followers enough to share his work with them so that they can grow. That is one of the greatest lessons of his leadership. If we brush other people aside in order to see a task done more quickly and effectively, the task may get done all right, but without the growth and development in followers that is so important. Because Jesus knows that this life is purposeful and that we have been placed on this planet in order to perform and grow, growth then becomes one of the great ends of life as well as a means. We can give corrective feedback to others in a loving and helpful way when mistakes are made. Jesus was not afraid to make demands of those he led. His leadership was not condescending or soft. He had the courage to call Peter and others to leave their fishing nets and to follow him, not after the fishing season or after the next catch, but now! today! Jesus let people know that he believed in them and in their possibilities, and thus he was free to help them stretch their souls in fresh achievement. So much secular leadership is condescending and, in many ways, contemptuous of mankind because it treats people as if they were to be coddled and cocooned forever. Jesus believed in his followers, not alone for what they were, but for what they had the possibilities to become. 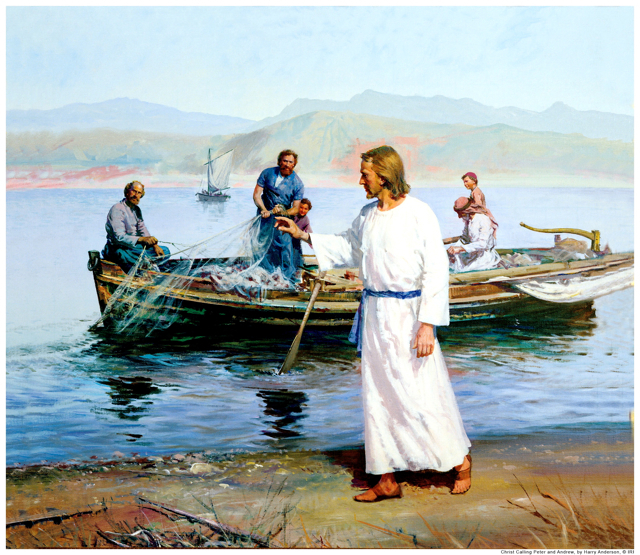 While others would have seen Peter as a fisherman, Jesus could see him as a powerful religious leader—courageous, strong—who would leave his mark upon much of mankind. In loving others, we can help them to grow by making reasonable but real demands of them. Jesus taught us that we are accountable not only for our actions but also for our very thoughts. This is so important for us to remember. We live in an age that stresses “no-fault insurance”—and “no fault” in other human behavior as well. Accountability is not possible, of course, without fixed principles. A good leader will remember he is accountable to God as well as to those he leads. By demanding accountability of himself, he is in a better position, therefore, to see that others are accountable for their behavior and their performance. People tend to perform at a standard set by their leaders. Jesus also taught us how important it is to use our time wisely. This does not mean there can never be any leisure, for there must be time for contemplation and for renewal, but there must be no waste of time. How we manage time matters so very much, and we can be good managers of time without being frantic or officious. Time cannot be recycled. When a moment has gone, it is really gone. The tyranny of trivia consists of its driving out the people and moments that really matter. Minutia holds momentous things hostage, and we let the tyranny continue all too often. Wise time management is really the wise management of ourselves. Those individuals whom we most love, admire, and respect as leaders of the human family are so regarded by us precisely because they embody, in many ways, the qualities that Jesus had in his life and in his leadership. Conversely, those leaders in history who have been most tragic in their impact on mankind were tragic precisely because they lacked to almost any degree the qualities of the Man of Galilee. Where Jesus was selfless, they were selfish. Where Jesus was concerned with freedom, they were concerned with control. Where Jesus was concerned with service, they were concerned with status. Where Jesus met the genuine needs of others, they were concerned only with their own needs and wants. Where Jesus was concerned with the development of his disciples, they sought to manipulate mortals. Where Jesus was filled with compassion balanced by justice, they have so often been filled with harshness and injustice. Perhaps all of us would not be the perfect example of leadership, but all of us can make a serious effort toward approaching that great ideal. We must remember that those mortals we meet in parking lots, offices, elevators, and elsewhere are that portion of mankind God has given us to love and to serve. It will do us little good to speak of the general brotherhood of mankind if we cannot regard those who are all around us as our brothers and sisters. If our sample of humanity seems unglamorous or so very small, we need to remember the parable Jesus gave us in which he reminded us that greatness is not always a matter of size or scale, but of the quality of one’s life. If we do well with our talents and with the opportunities around us, this will not go unnoticed by God. And to those who do well with the opportunities given them, even more will be given! The scriptures contain many marvelous case studies of leaders who, unlike Jesus, were not perfect but were still very effective. It would do us all much good if we were to read them—and read them often. We forget that the scriptures present us with centuries of experience in leadership, and, even more importantly, the fixed principles upon which real leadership must operate if it is to succeed. The scriptures are the handbook of instructions for the would-be leader. I make no apology for giving something of the accomplishments of Jesus Christ to those who seek success as leaders. A second time he said, “Whom seek ye?” and when they named him, he said, “I have told you that I am he: if therefore ye seek me, let these [his disciples] go their way.” (John 18:4-8).